In 2015 Deloitte was engaged to conduct a strategic assessment of the regional life sciences. The process utilized the “Collective Impact” model from Stanford University and was led by an experienced steering committee comprised of community and business leaders in the life sciences. The committee looked at both drivers of cluster enhancement and regional scientific strengths. 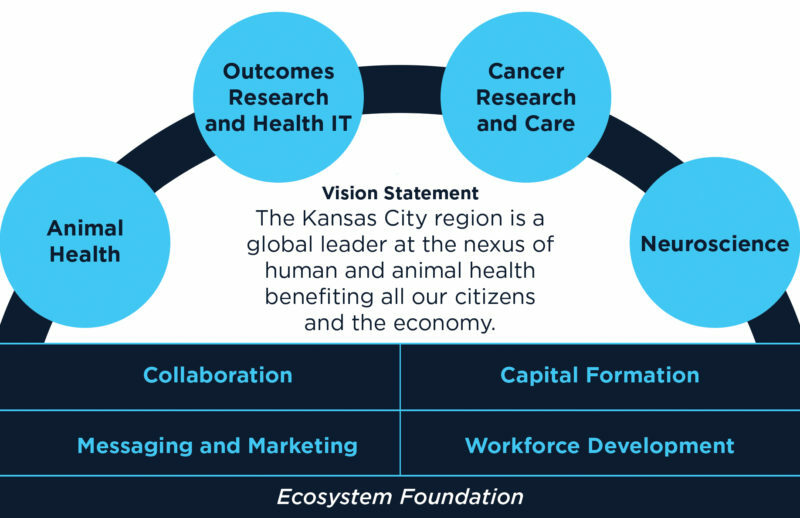 The regional vision developed through the assessment process states, “The Kansas City region is a global leader at the nexus of human and animal health benefiting all our citizens and the economy.” These nexus opportunities will be different for each strategic area and will likely range from using naturally occurring cancer in dogs for accelerating human discoveries to advancing our strength in health IT and outcomes research. Four areas of scientific strength were identified: animal health, cancer research and care, neuroscience, and health IT and outcomes research. Additionally, four drivers of cluster enhancement were identified: collaboration, workforce development, capital formation, and messaging and marketing. Task forces were created for each cluster driver and work groups for each scientific area. We believe the work of these groups will be critical for the success of our entire ecosystem and enable us to be more globally competitive. The group is developing a pilot project to demonstrate the impact of outcomes research on quality patient care, improved patient outcomes, and cost savings for participating hospitals. The group is exploring ways to enhance communications and trials between human cancer physicians and veterinary oncologists to accelerate research and care for both humans and animals. The group identified opportunities to develop a proof of concept fund and interconnect large animal health databases with the human health databases to accelerate drug development. The group evaluated federal funding to identify competitive neuroscience research strengths and divided into subcommittees – one focused on neurodevelopmental diseases and one on neurodegenerative diseases. As Kansas City’s life sciences initiative continues to evolve, the primary areas of focus are evaluated on an on-going basis by the BioNexus KC staff, board and various advisory committees.